A few weeks ago, we’d done a story on how reckless and tasteless actions of some employees have brought their companies down. Today as the news of a massive earthquake (richer 7.9 scale) in Nepal and parts of India, broke out on twitter, there was a wave of shock and dismay. Thousands of Indians showed solidarity to their neighbouring country as photos of its age old heritage monuments and sights, once majestic and beautiful, now reduced to rubble floated around. Immediately twitter swung into action and tweets with helpline and emergency numbers started doing the rounds. Google posted a timely tweet about its people finder app. However, there are some brands who used this time of a fatal disaster and a tragedy as an opportunity to cash in on the ongoing chatter and plug their products. 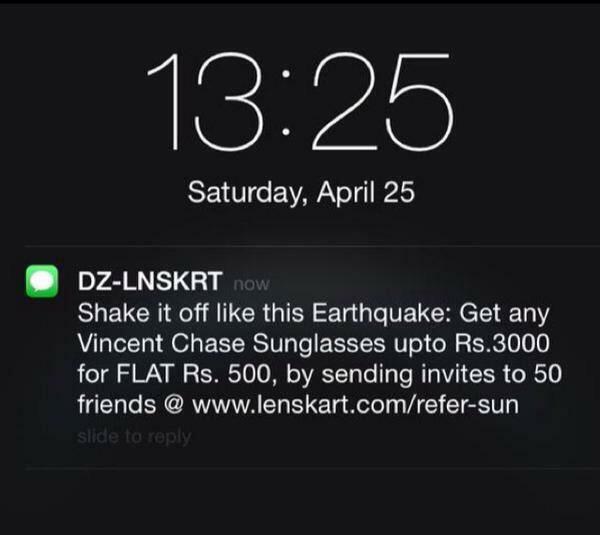 Lenskart incurred the wrath of the internet when they released this SMS campaign a few minutes after the news of the earthquake. And though they started apologizing for the message later, the damage was already done. 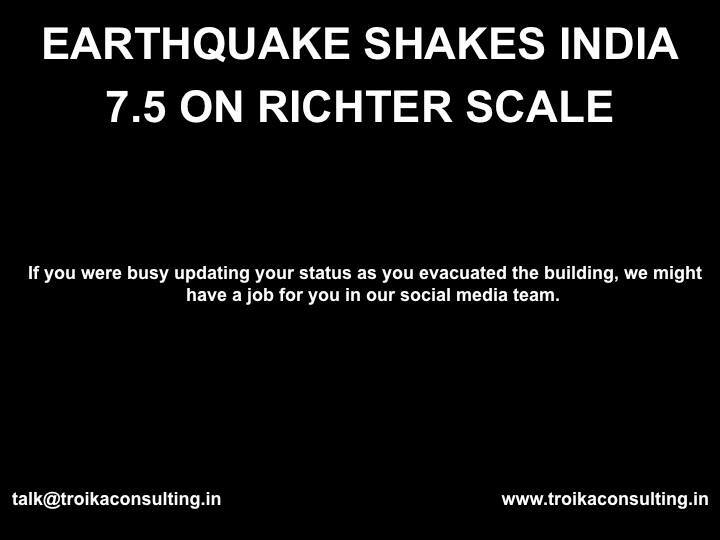 This advertising agency was not far behind as it guised the earthquake news as an opportunity to post a recruitment ad, sparking off a huge debate and a round of rebuttals on the group it was posted on. 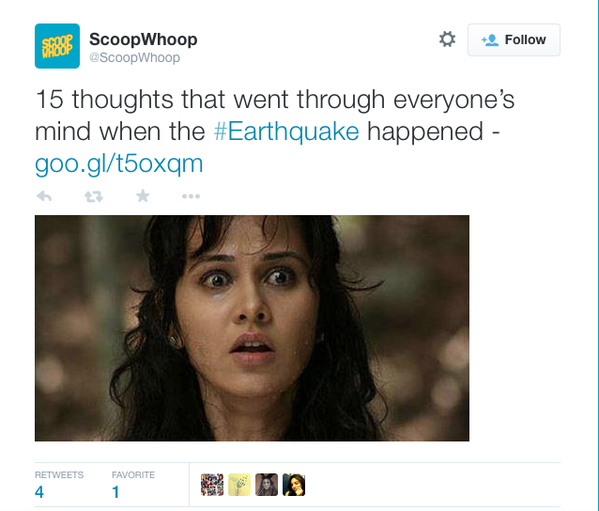 And finally, the popular content website Scoopwhoop that specialises in Indian centric content, true to its style, posted a “15 thoughts that went through everyone’s mind when the earthquake happened” listicle well after the news of the intensity of the earthquake was well underway on social media. Though they immediately deleted the tweet, anticipating the backlash against them, the fact that the company decided to use their massive traffic and engaged audience to publish a list presumably made up of Bollywood GIFs and tasteless puns, instead of dispensing helpline and SOS numbers, is discomforting. How far can companies go to capture social media’s attention for marketing, irrespective of the sensitivity required in times like these where lives have been lost? Unlike in a more organized form of advertising- For eg. Google AdWords, where words relating to a tragedy or a natural calamity are strictly prohibited to be used as keywords for brand campaigns, there is no governing body to dictate the rules for social media campaigns. And everyday we continue to see one tasteless or inopportune brand message that could potentially ruin the reputation of the brand for its hitherto loyal audience.